Our first Geothoughts Conversations piece takes a look at crowdsourcing, the topic of the 2015 Summer Institute. One of the hallmarks of any academic conference are the conversations that take place in-between sessions, in the hallways and over meals. In our first Geothink Conversations we aim to give you a flavor of these discussions at Geothink’s now concluded 2015 Summer Institute. This month’s conversation features Geothink Head Renee Sieber, associate professor in McGill University’s Department of Geography and School of Environment; Robert Goodspeed, assistant professor of Urban Planning at the University of Michigan’s Taubman College of Architecture and Urban Planning; Daren Brabham, assistant professor in the University of Southern California Annenberg School of Journalism and Communication; and Monica Stephens, assistant professor in the Department of Geography at State University of New York at Buffalo. And, of course, I’m Drew Bush and I’ll be helping steer the conversation along. Each day of the institute alternated morning lectures, panel discussions and in-depth case studies on topics in crowdsourcing with afternoon work sessions where professors worked with student groups one-on-one on their proposal to meet a challenge posed by the City of Ottawa. For more on the Institute, check out our web site at geothink.ca. To start us off, Brabham gets the group rolling on what exactly defines the boundaries of crowdsourcing, the topic of many conversations overheard during the three-day conference. This entry was posted in Geothoughts Podcasts and tagged conversations, crowdsourcing, Daren Brabham, Geothoughts, Geothoughts conversations, Monica Stephens, podcast, Renee Sieber, Robert Goodspeed, Waterloo on August 17, 2015 by Drew Bush. 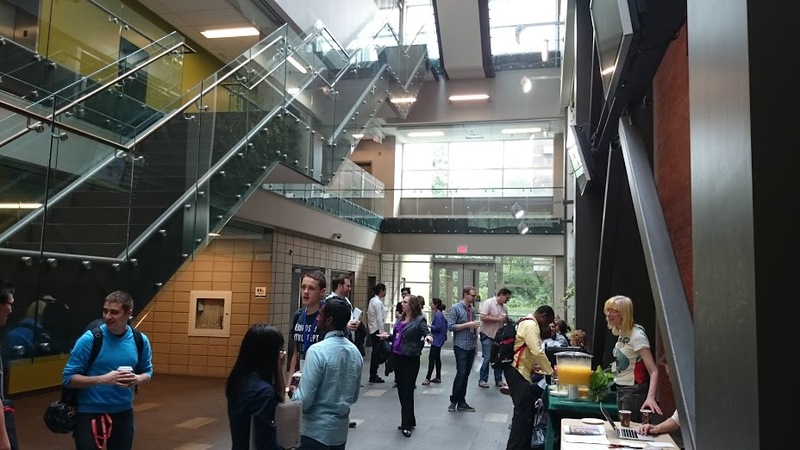 Time for each of the seven competing teams to meet and work on their proposals in the upstairs classroom of the Environment 3 Building at the University of Waterloo during Geothink’s Summer Institute. Day two of Geothink’s Summer Institute began with a deeper dive into crowdsourcing led by Robert Goodspeed, assistant professor of Urban Planning at the University of Michigan’s Taubman College of Architecture and Urban Planning. In the morning, he presented hot topics in his own research including crowdfunding, formal crowdsourcing and the crisis-mapping tool Ushahidi. Each day of the institute alternated morning lectures, panel discussions and in-depth case studies on topics in crowdsourcing with afternoon work sessions where professors worked with student groups one-on-one on their submission to the City of Ottawa on day three. Not sure what constitutes crowdsourcing? The goal of the institute, run as part of a five-year Canadian Social Sciences and Humanities Research Council (SSHRC) partnership grant, was to provide undergraduate and graduate students from Geothink’s partners with knowledge and training in theoretical and practical aspects of crowdsourcing. See our post from day one to learn more about this important topic. After some coffee, specific case studies brought home what crowdsourcing looks like in practice and the limitations of some crowd-sourced data due to demographic biases with gender amongst users who geo-reference data. Provided by Monica Stephens, assistant professor in the Department of Geography at State University of New York at Buffalo, and Daren Brabham,, assistant professor in the University of Southern California Annenberg School of Journalistm and Communication, these additional case studies gave insight into the types of research undertaken by Geothink researchers. A random survey of users within many online mapping communities coupled with a look at interactions among members in specific communities proved revealing for Stephens. “What became clear was that women were just as willing to socially tag, I was with so-and-so, but they weren’t willing to include the geographic information the way that men were,” Stephens told students in her case study on OpenStreetMap and other internet mapping communities. This simple fact, she demonstrated, has profound impacts on the types of features and attributes that get approved for inclusion on many maps. For the students, the afternoon proved just as stimulating as all seven groups presented their initial concepts to the professors for feedback and guidance. “You also get to think out of the box,” added her teammate, Ashley Zhang, a Ph.D. candidate at Waterloo University’s Department of Geography and Environmental Management. Stay tuned for more iTunes podcasts from the Summer Institute here, check back on Geothink.ca for our last synopses of day three, and, of course, watch more of our video clips (which we’ll be uploading in coming days) here. This entry was posted in In The News and tagged crowdsourcing, Daren Brabham, gender, Geothink, geothink students, Monica Stephens, Openstreetmap, Renee Sieber, Robert Goodspeed, Summer Institute, Ushahidi on July 6, 2015 by Drew Bush. The main atrium of the Environment 3 Building at the University of Waterloo between sessions at Geothink’s Summer Institute. The day began with a warm welcome from Geothink Head Renee Sieber, associate professor in McGill University’s Department of Geography and School of Environment. By afternoon, the City of Ottawa had presented the 29 students attending Geothink’s Summer Institute at the University of Waterloo in Ontario, Canada with the challenge of engaging its citizens with city natural areas. 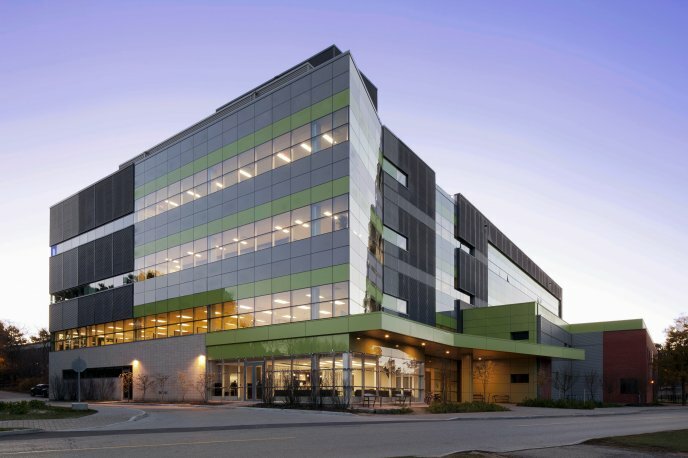 Each day of the institute alternated morning lectures, panel discussions and in-depth case studies on topics in crowdsourcing with afternoon work sessions where professors worked with student groups one-on-one on their proposed solution to the City of Ottawa’s challenge. As the institute progressed, more time was given to the seven student groups to work on their solutions and prepare a final pitch to the city on day three. The morning lecture topics ranged from “Conceptual Foundations in Crowdsourcing” to “The Future of Crowdsourcing in the Public Sector” and were taught or co-taught by Sieber, Robert Goodspeed, assistant professor of Urban Planning at the University of Michigan’s Taubman College of Architecture and Urban Planning; Daren Brabham, assistant professor in the University of Southern California Annenberg School of Journalistm and Communication; and Monica Stephens, assistant professor in the Department of Geography at State University of New York at Buffalo. On Day 1, students at Geothink’s Summer Institute worked together to solve Ottawa’s crowdsourcing problem using the knowledge gained in earlier sessions as well as individual areas of expertise. Much like many real-world challenges that crowdsourcing has been used to address, the presentation from the City of Ottawa made clear that the problem the city faced was complex and multifaceted. Goodspeed helped to summarize some elements of what was expected of students. After they’d been given a chance to start discussing ideas for crowdsourcing applications in their groups, Sieber and Stephens helped students to begin thinking about the geographical aspects of the applications they were designing as well as technical limitations they might face. “If nothing else, that implies there is a jurisdictional aspect to the way that people communicate with government, that is that people are bounded in place,” she added. Watch a clip of the presentation the City of Ottawa gave our students here (Beware, for the technophobic, it was conducted over videoconference). 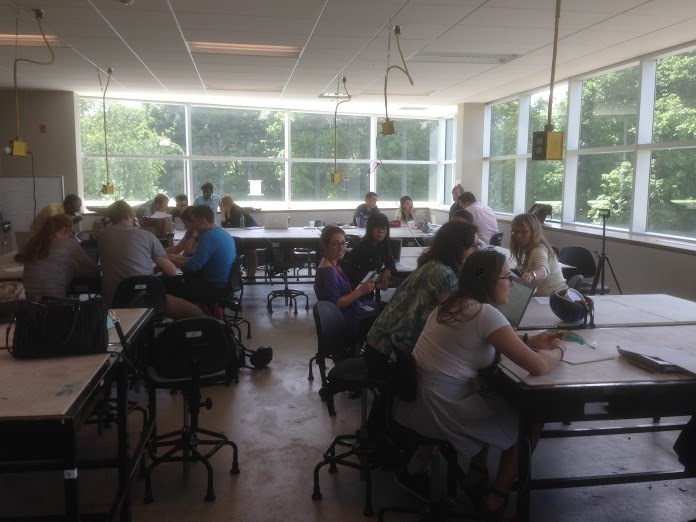 This entry was posted in In The News and tagged Canada, crowdsourcing, Daren Brabham, Geothink, geothink students, Monica Stephens, Renee Sieber, Robert Goodspeed, Summer Institute, Waterloo on June 30, 2015 by Drew Bush.